A blowhard I once knew morphed into a rabid Zionist. He was no prize package before that but when he started spouting hasbara, he just got ugly. He wrote a biography where he described growing up with parents who met at a séance conducted by a dead 13th century crusader & steeped his childhood in ghostly apparitions, spirit guides, star charts, & astral planes. So his embrace of Zionist irrationality just fit right in with all the other goblins. The ability to believe kooky things contrary to all the evidence is a hallmark not just of Zionists but in almost every instance of irrational beliefs, there is a direct connection to social hatred of some kind, especially racism. Many liberal Zionists cannot accept the reality of mountains of evidence for ethnic cleansing in Gaza because they cannot break with Zionist belief in the special character & superiority of Jews nor can they break with racism toward Palestinians–which they hide behind criticisms of Hamas rockets. The political problems of Hamas have nothing to do with Israeli ethnic cleansing–which is why evidence is eschewed & irrationality embraced to defend Israel. But irrationality employed ostensibly to defend Palestinians is just as vile. You cannot oppose racism & social hatred by spouting crazy-assed theories about illuminati & Jewish bankers. The other guy who plied that kind of crap was Adolph Hitler. So unless you want to end up as a status on my wall, keep that crap away from here. Palestinian justice deserves better than that. You can’t serve justice with hatred. 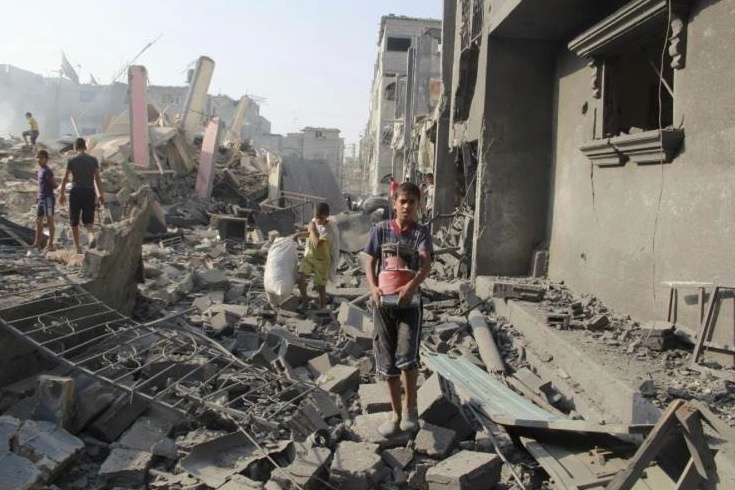 This young boy in Rafah, Gaza is looking for belongings midst the rubble of his house. 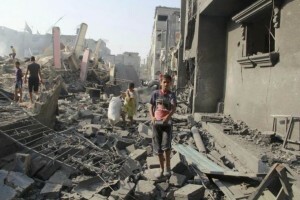 Previous PostHomeless in GazaNext PostDoes Israel use bullets to take out cement tunnels?